Serving Los Angeles and Orange Counties in Southern California for over thirty years, our family owned and operated company specializes in the installation and monitoring of Commercial & Residential security alarm systems, with quality and reliable services you can count on. Our friendly and professional team members are always ready to answer any questions you may have about our company or our alarm systems and services. Whether you need a completely new alarm system, an upgrade to your existing alarm system, or an affordable, reliable monitoring service for an existing alarm system we have what you need at reasonable prices. At Greater Los Angeles Patrol, our goal is to provide our clients with courteous, expedient, of the highest caliber professional alarm system installation and monitoring services. If you have any questions or would like to speak with one of our representatives regarding any of our security alarm services, please contact us or call us at (818) 507-8500. For over thirty years, we have been designing, installing, and maintaining security alarm systems, CCTV, and access control systems, with professional system monitoring, for businesses across almost every industry sector from corporate headquarters to retail stores; art galleries and more. We understand that every residence is different and every homeowner needs their personal home alarm security concerns addressed, as well particular installation or monitoring requirements. That is why we offer tailored alarm systems and support services to suit all manner of different homes from city apartments to county residences. 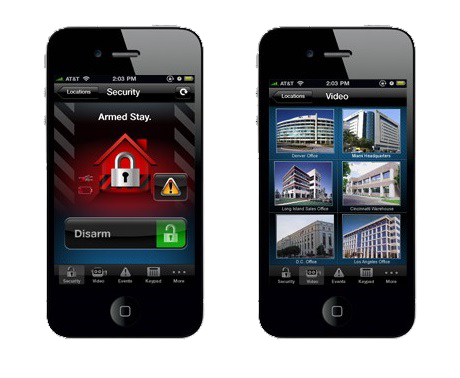 We work with a wide range of security equipment manufacturers. From basic alarm control panels to complete video surveillance systems. From access control to remote control. Every alarm system installation can be unique, that why we design and install the exact security alarm system you require. Please accept this as a regretful letter of cancelation of service for my deceased mother's two residential alarm services. I convey Mom's undying gratitude for the many years of dedicated, prompt, and efficient service, as well as the friendship you have all offered in the process. A fantastic alternative to monolithic alarm companies that get you locked into multi-year contracts. Greater Los Angeles Patrol did a great installation at a great price for a Wired Alarm System (not that wireless junk). On top of that, they have a monthly charge for monitoring, with no contract, cheaper and just as good as the big guys. Circadian S., Los Angeles, CA. Fabulous service form a family-owned business, with a real focus on personal care and attention. Highly recommend anyone looking for an alarm installation and monitoring company to call these guys. I couldn't be more happy with the professional service I have received from Greater Los Angeles patrol. I have saved money and still maintained a safe environment for my family. What could be more appealing than that? *Requires a Honeywell Security System and Total Connect Remote Services subscription. © Copyright Greater Los Angeles Patrol 2016 | State of CA License #: ACO2006 | All rights reserved.